Have you ever heard the term ‘Catholic Terrorism’? No, you haven't... because that was not used when IRA (Irish Republican Army) was bombing and terrorizing. But blindly the term 'Islamic Terrorist' is wrongly used in the media which signals very negetive signal and give wrong perception. 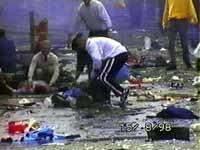 We rarely, if ever, called the IRA bombings "Catholic" terrorism because we knew enough to realise that this was not essentially a religious campaign. Indeed, like the Irish republican movement, many fundamentalist movements worldwide are simply new forms of nationalism in a highly unorthodox religious guise. This is obviously the case with Zionist fundamentalism in Israel and the fervently patriotic Christian right in the US. Technology of the Heart: Have you ever heard the term ‘Catholic Terrorism’?